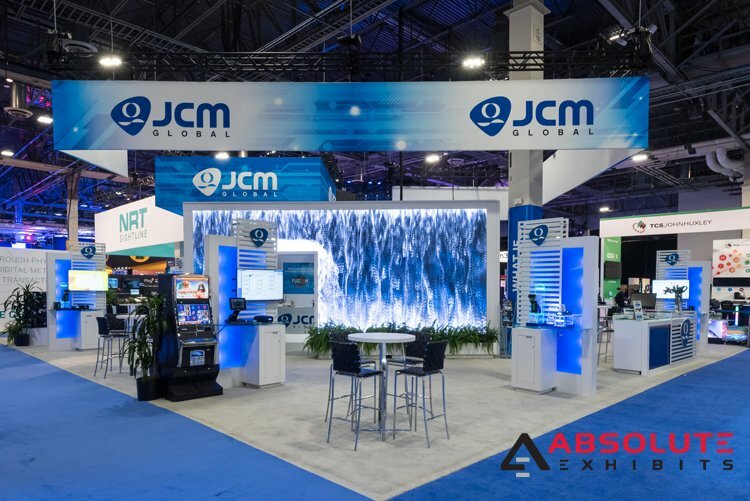 6 Exciting Trade Show Booth Design Ideas for 2019 | Absolute Exhibits, Inc.
More exhibit houses have purchased CNC cutting machines and as such, the creative logos that they’ve produced are becoming more popular. 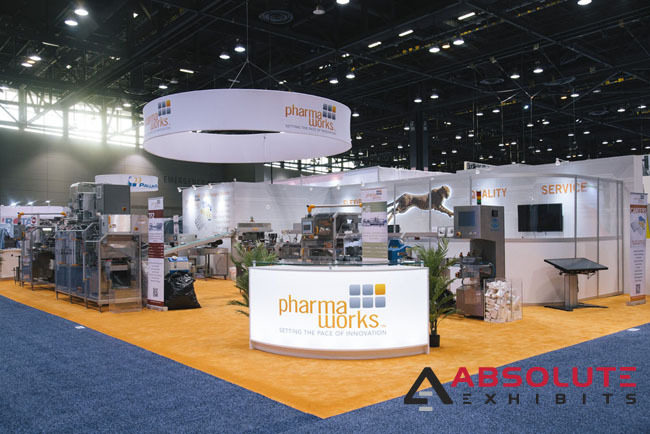 This trade show booth design idea is popping up across industry shows from plastics to machinery to technology and more. CNC cut logos are becoming very popular because you can get a 3D look with a logo no matter how intricate the logo. At a recent show, Absolute Exhibits produced a CNC cut cheetah for one of our clients, making it look like it was almost leaping off the trade show booth. We’re sure to see and produce more of this trade show booth design idea. For years, flooring has been evolving and now you can get almost anything under your feet from special wood flooring to raised and edge lit flooring. No matter your vision, there are numerous trade show booth design options from faux stone to plastic, wood, or even specialty carpeting. If your trade show booth design is rather simple, you might want to consider some specialty flooring to spice things up. LED walls are fast becoming one of the most popular trade show booth design ideas. Everybody wants to look high tech and modern. LED walls provide that option. 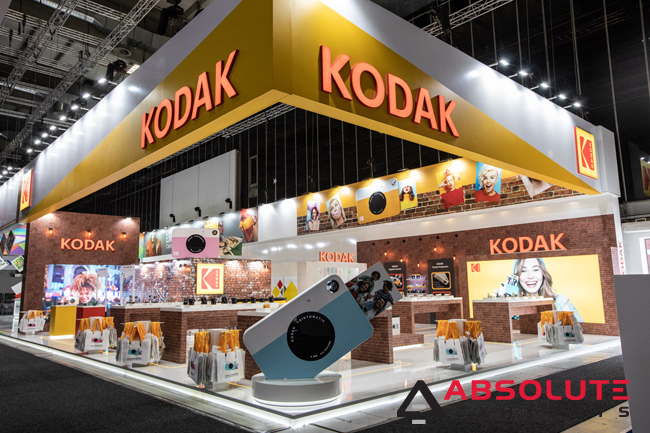 Some exhibitors use it as a method to change the texture of their trade show booth design and some use it as a means to play their commercials or present messaging. 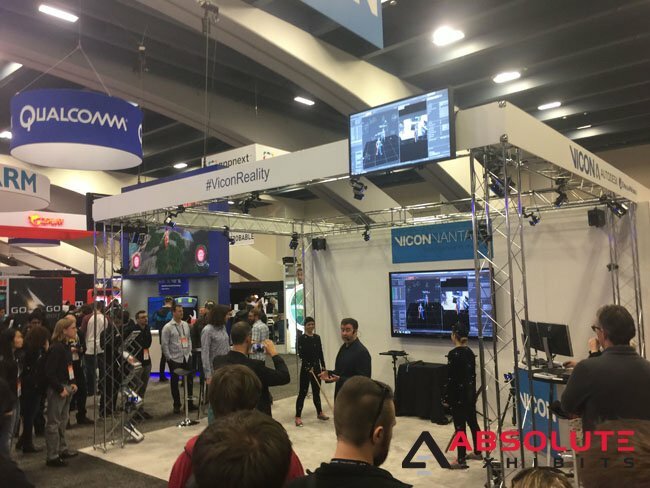 No matter the purpose, LED walls are popping up in exhibit halls across the globe across multiple industries. 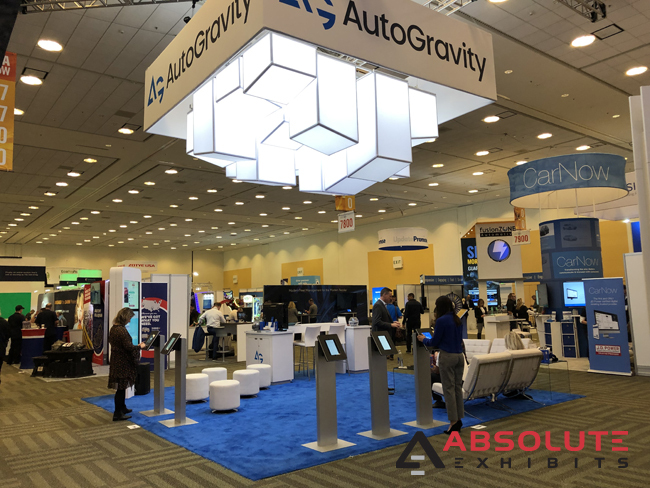 Absolute Exhibits has been able to not only incorporate them into a trade show booth design to change texture, but also as a part of hanging signs, demonstration areas, and more. The possibilities are literally endless. Exhibitors are finally grasping the notion that people are bombarded with visuals across the exhibit hall. To set themselves apart, they’re beginning to also engage other senses such as touch. Exhibitors across sectors are increasingly using touch screens in their trade show booth design. Whether in the automotive space, HR space, or technology, touch screens have become very popular. Absolute Exhibits has produced touch screens in the shape of an iPhone, as kiosks, and more. We expect this trend to continue well into 2019. Virtual and augmented reality have become exciting new technologies in the trade show industry. The possibilities to engage visitors’ senses whether to pick out furniture or to immerse someone in your brand identity to become the product you sell are exciting. Trade show attendees love this technology because it’s new, unexpected and you never know what to expect. In 2019, we expect to see virtual and augmented reality as a part of more trade show booth design requests. In years past, lighting was an accent that helped you to see in the trade show exhibit or incorporated to highlight products on a wall. Now, lighting has gotten bigger, better, and bolder. Today, lighting is an integral part of a trade show booth design and draws people from across the exhibit hall. Bold and innovative lighting is one of the most exciting elements of design that continues to evolve and we can’t wait to see where it goes from here. Design trends change and things that were once the most cutting edge becomes passé. 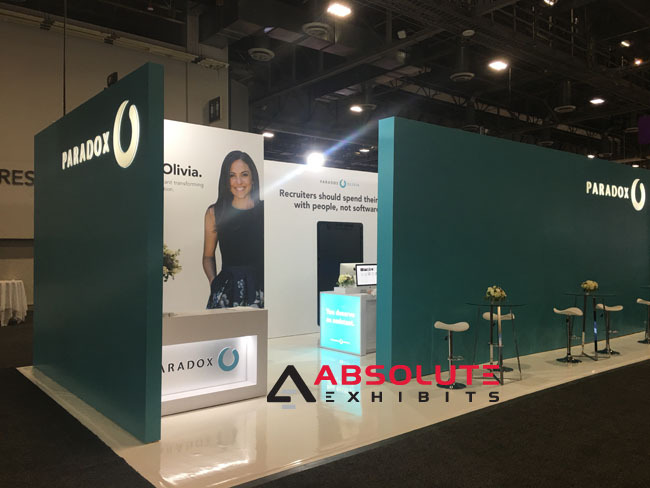 But that being said, we’ve noticed these trade show booth design ideas and trends are going to keep flourishing in 2019 across multiple industries and multiple shows. We’re not living in the age of the Jetsons yet, but as technology continues to push us further, we may very well see some glimpses of it in our trade show booths.